Coca-Cola Pay It Forward program a couple months back. That was the nomination phase, and now the final voting is open to help select the winners. Below are the detailed steps on how to vote for the finalists. Pay It Forward with Your Vote! Voting is now open for the top Coca-Cola Pay It Forward finalists! These teens have worked very hard, so “pay it forward” by checking out their videos and voting for the nominee(s) you think should win a 3-day summer mentorship experience in Atlanta. Voting ends May 24, 2015.
empowering moms and communities to help high school students succeed. The Coca-Cola Pay It Forward Academy, hosted by Steve Harvey, will offer 20 winning teens and their mom/parent/legal guardian 3 days of mentorship, leadership and networking opportunities, and each teen will be awarded a $5,000 scholarship. 5) Click on the social icons to share the excitement with friends and family and encourage them to vote! This post is sponsored by Coca-Cola. All opinions expressed are my own. Ever since my first born was an infant, she suffered from eczema. Her doctors all stated that she would probably outgrow it and for the most part, she did. She went through a good 4-5 years beings mostly eczema free, until last summer. She had a flare-up that was the worst any of us have ever seen. When you have such a beautiful young woman covered in thick patches of elephant-like skin, it can be devastating. She was always itchy and irritated. It turns out that allergies were part of what was making her eczema flare up. She had to start taking daily allergy medications, consume more water and also change all of her laundry products. We started buying all free clear laundry products and she immediately noticed a difference with the itching she suffered with so badly. I was glad to see that all free clear also carries fabric softener liquid and sheets. I know she missed very fragrant laundry, but having clearer skin has been worth it! all® free clear detergent (liquid and mighty pacs), fabric softener and dryer sheets have received the National Eczema Association (NEA) Seal of Acceptance™. This is GREAT news for my eczema sufferer! We are so happy that all free clear products have enabled our daughter to be comfortable in her skin again! Do you or someone you love suffer from eczema? I absolutely encourage you to try all free clear products. They have been a life saver! Giveaway is open until May 31, 2015 and winner will be contacted via email to claim prize. Follow Rafflecopter instructions and good luck! There are many subjects that are really uncomfortable to discuss and one of them that tops the list is bladder leakage. You are feeling uncomfortable now, aren't you? Well, it is something that doesn't only happen to senior citizens. Believe it or not, there are more people with bladder leakage in their 20’s than their 80’s and over 65 million people have experienced this issue. I have known people younger than me complain about this problem when trying to exercise, cough, sneeze or even laugh. It's very common and you should not be ashamed of it! Are you unsure if Depend Silhouette Active Fit briefs are right for you? Get a FREE sample to try out for yourself (or someone you love). 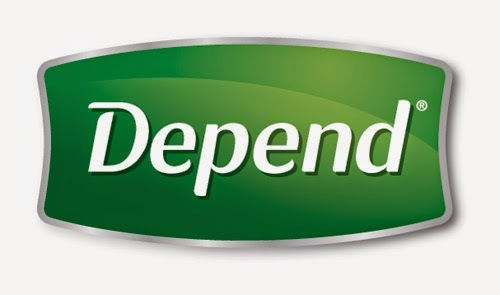 Regain your freedom with Depend! GIVEAWAY: Want to win $15 via PayPal? Simply go here and tell me what you learned about the #Underwareness Movement. Leave me a comment below and I will randomly pick one winner. You can also Tweet this giveaway (just leave a link to your Tweet in the comments section). Giveaway open until June 5, 2015. Good luck! BI-LO is giving away $75,000 worth of free groceries to customers in some of the Southern states. Fifteen (15) BI-LO customers in Georgia, North Carolina, South Carolina and Tennessee will win FREE groceries for a year, valued at $5,000 each, by entering the Great Grocery Giveaway. Additionally, every person who enters the giveaway will automatically receive a $10 off $100 purchase coupon. I love this since we use the BI-LO fuel perks. Everybody wins! 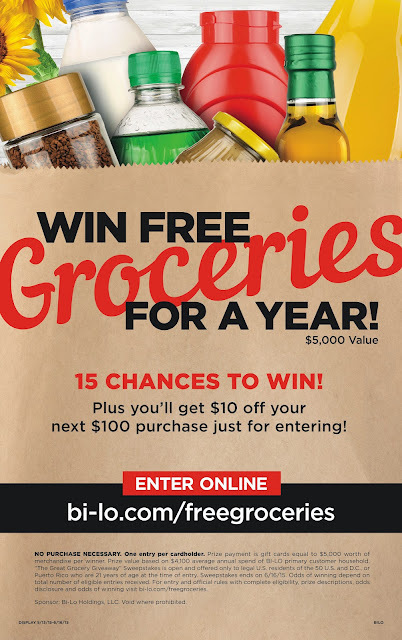 Customers can visit http://www.bi-lo.com/freegroceries now through June 16 for official rules and to enter-to-win the Great Grocery Giveaway. Can you imagine how much $5000 for a year of groceries would help your family? I encourage you to enter if you live in any of the states listed above-- you have nothing to lose! It took me less than a minute to enter (just have your BI-LO bonus card number handy) and you will receive an email to validate your email address. Two minutes of your life that can be worth a year of FREE groceries! Giveaway is open until May 30, 2015 to U.S. Residents only, but remember, the #BILOfreegroceries Giveaway is open on their site until June 16. Be sure to leave a valid email address so you can be contacted in the event you win. Good luck! Thank you BI-LO for sponsoring today's giveaway. 1. Get your finances together and be aware of your expenses. – Open a checking/savings account if you don’t already have one. Get in the habit of saving your receipts and documenting them weekly/monthly or however you choose. Your expenses will add up, so it’s best to stay on top of them so you don’t end up in a rut or overdrafting your account. 2. Take the time to read things and understand them. – You are an adult now, and you actually have to read through things to make informed decisions. This will certainly apply if you move off campus into an apartment. 3. Rent your textbooks if you can. – Renting is the best way to go, especially for books for general education (gen-ed) classes. Vendors such as Amazon and Chegg are great places to get them. You can buy books from your institution’s bookstore and sell them back at the end of the semester, but you won’t get nearly as much money back as you spent. 5. Take school seriously. – Your first year of college is so important for your GPA. Focus on your grades first. If you keep it high your first year of school, you have some wiggle room if you don’t do as well one semester. Also, if you have scholarships, you need to make sure you maintain the GPA required to keep the scholarships. 6. Get to know your professors. – Your professors possess a lot of knowledge, and you’ll do even better in class if you sit in the front and introduce yourself to them. If you take the time to get to know them, they will be more willing to help you in class or with other things. Some professors have written recommendation letters for me. 7. Don’t be afraid to get involved, but don’t over involve yourself either. – There are TONS of ways to get involved at your college/university. Try to get involved in at least one activity or organization so you can meet people and begin developing skills. However, don’t get over involved either. You don’t want to be overwhelmed and affect your grades or well-being. 8. TIME MANAGEMENT IS KEY. – Get a planner if you don’t have one already! You’ll be super busy with classes, extracurricular activities, and maybe even a job. Be sure to stay organized! 9. Take care of yourself. – People are going to ask you to do things, approach things in their way, but at the end of the day, you need to do what is best for yourself. If people want to go out and do something, but you want to take an evening for yourself and watch TV, then by all means, watch TV! College goes by so quickly! Take the time to explore new things. Take a class on something you’re interested in, but might not be majoring in. Meet new people and make great friends. The world is yours. Guest post by my oldest daughter, Chardonnay Ismail. Although we are still technically in the Spring season, it sure has been feeling summer-like outside. With the end of school near, this mean more cookouts and barbecues with the family. 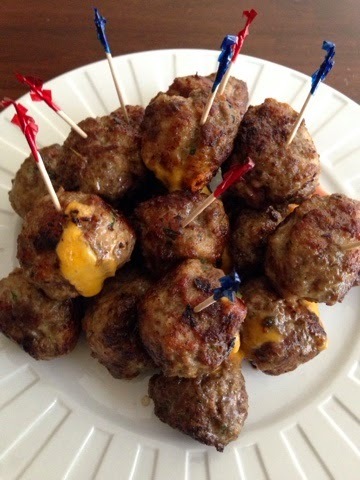 We grill out almost daily in the summer months and are always looking for easy side dishes to make. I have never tried Suddenly Salad before and thought I would give it a try. 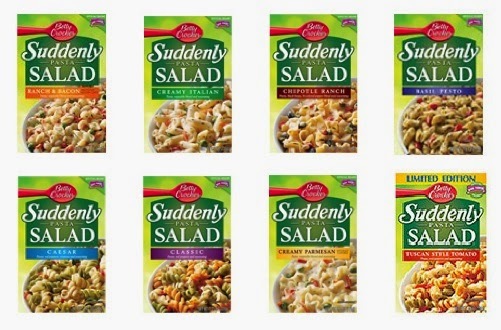 There are so many varieties of pasta salads to choose from like: Classic, Caesar, Chipotle Ranch and Creamy Parmesan just to name a few. 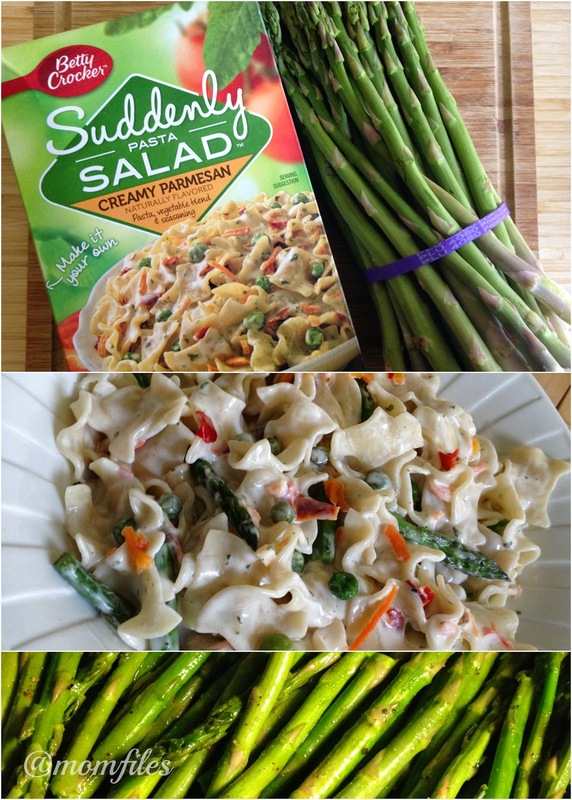 I picked up a box of Suddenly Salad in Creamy Parmesan from my local Publix Supermarket and grabbed some fresh asparagus to make this pasta salad my own. I sauteed the asparagus in a little olive oil and butter along with a little seasoning. I followed the simple instructions on the Suddenly Salad box and prepared the pasta salad. I cut the cooled asparagus in about one inch pieces and tossed it into the pasta salad. The results? A super easy, chilled pasta salad packed with flavor that took me 20 minutes to make. To make your mealtime even easier, you can pre-season or cook your protein the day before and make your pasta salad closer to the time you plan to serve your meal. 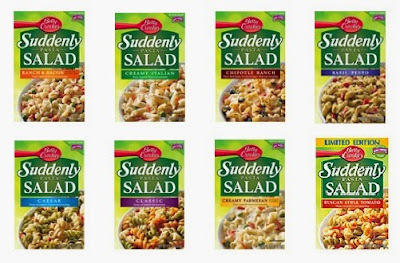 Suddenly Salad pasta salad is a great item to bring to a potluck. You can make two boxes at once with ease. Speaking of two boxes, be sure to grab a printable coupon or you can download one to take $.50 off two boxes at Publix. The ideas are endless when making these pasta salads. You can even make it a main dish if you wanted to. Giveaway open until May 26, 2015 worldwide. Be sure to follow Rafflecopter rules for your entries to count. One winner will be contacted via email to be awarded prize. Good luck! Did you know that Mother's Day kicks of the 16th annual National Women's Health Week? As women, especially moms, it is so important to take charge of our health. I am officially in my forties and have been staying active in keeping up with different areas that affect my overall health and well being. 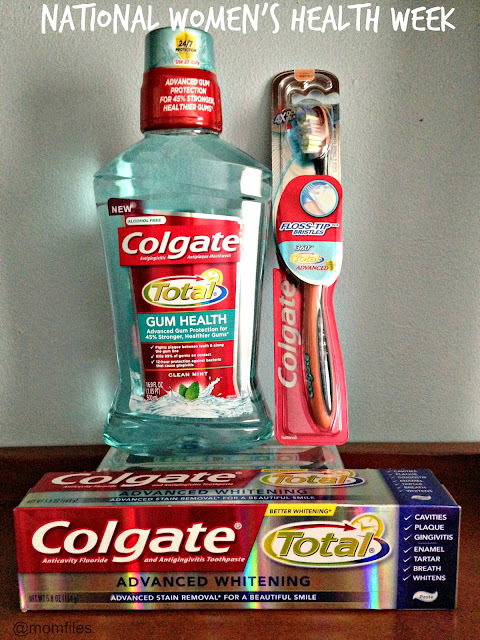 Regular doctor's visits, a healthy diet and exercise are a must as well as a good oral care regimen. I just went to my doctor last week to get labs done and learn the latest updates on my current health. It turns out that my vitamin D levels have dropped extremely low again. Normal levels are between 30-100 and mine was at 19. I'm so glad I met with my doctor and found this out. It explained a lot in regards to how I have been feeling lately. I can now take the steps necessary to get my levels back up so I can have the energy to do all that I have to each day. Visit a doctor or nurse to receive regular checkups and preventive screenings. Schedule your annual well-woman visit on National Women’s Checkup Day, Monday, May 11. Use this time to discuss your health goals, concerns or questions. Chicken Pad Thai, Palak Paneer, and Channa Masala. My personal favorite it the Chicken Tikka Masala variety. This is the only frozen meal I have ever tasted that compares to what you would get in a fine restaurant or cook yourself at home. The best part is that you can enjoy all of the authentic Indian flavor in the comfort of your own home with no cooking! I just can't get over how juicy and succulent the chicken pieces are and how much flavor is packed into the sauce. The rice tastes as if you just scooped it fresh out of a rice cooker. I love that they use all real ingredients. It gets 5 stars from me! Look at all of that REAL food! Tandoor Chef will have a special page on their website where readers can guess weekly what the gluten free dish of the week is. Every week, we will choose one winner from those who answered correctly and they will win a month supply of Tandoor Chef. The contest is going on from May 4th - June 1st. Be sure to visit Tandoor Chef on their website and follow them on Facebook, Twitter and Instagram for product updates and promotions. I was provided with product coupons to purchase items and post an honest review. All opinions are my own as always.